We took a detour on Ben's birthday road trip and instead of back to Dallas, we headed to Illinois to visit a good friend of mine. In talking about back to school breakfasts, she mentioned looking for ones she could freeze (her kids way outnumber mine) and I remembered our homemade Egg McMuffins. I know, bad picture, it's the only one I have right now. These were originally posted on my personal blog in February 2010, but I had to bring it over here since they are pretty cool. I am highly intrigued by the round eggs on real Egg McMuffins and Shaun (who worked at McDonald's in high school) told me that those involve a mold on the griddle. Well, since I don't have a mold or a griddle, I decided that muffin tins were the next best things. Finished egg circles, the dark spots are the ham. Basically, we sprayed baking spray in the tins and folded a slice of ham at the bottom (bacon or sausage is good too, but we didn't have those during this experiment and I'm having to use old pictures). I mixed egg, milk and a little bit of egg white and poured it over the ham, then baked it for about 25 minutes at 350 in the toaster oven. You can do a whole tray of these and freeze them too, then just warm them and top with a slice of cheese for school day breakfast while you toast the English muffins. and I've since bought a new toaster oven since this one was atrocious. 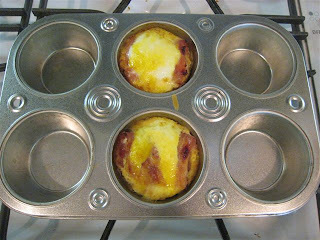 I love breakfast ideas, and I love your muffin tin ideas too. I saw Steamy Kitchen do a bacon egg and toast similar to this. I would have to break the egg first, not loose yolk for me! I think the photo looks fine, I would want that sandwich right now! Love the idea. I saw one similar a while back that involved microwaving the egg and ham in a custard cup, but I really don't care for the texture of microwaved egg. I'll have to try this one. Looks yummy!! Cute idea! 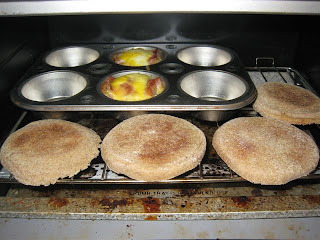 I recently posted the same muffin recipe lol- but I LOVE the added english muffin. Brilliant idea! How do you warm them up from the freezer? 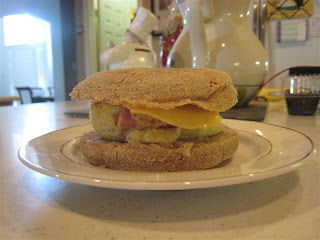 We tried a similar recipe, but when reheating the whole thing (english muffin, cheese, egg, sausage) in the microwave, the egg was rubbery, and not at all appealing. The initial egg-mcmuffin was good, but not the reheated frozen one. I reheat the egg separately in the toaster oven next to the muffin. I only freeze the egg/ham combo and use fresh muffins/cheese.